This year Dutch Games Association will organise another Holland Pavilion at Gamescom 2019! With over 370.000 attendees in 2018, gamescom is one of the most important conferences for game developers. In 2018, over 23 companies participated at gamescom and the Holland Pavilion was a great success. Did you know the strongest international growth was due to presence from Austria, UK and the Netherlands?! Read more Gamescom’s growth here. 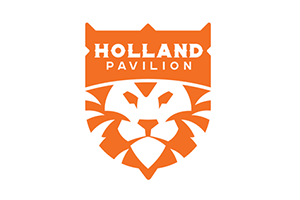 We celebrate the tenth edition of the Holland Pavilion with a new stand design. Based on last year’s suggestions we’ve created a new look and feel, whilst still having both showcase and meeting options available for our participants. Are you interested in participating in the Gamescom Holland Pavilion 2019? Register below! It is possible to request a Collective Activity Voucher (Voucher Collectieve Activiteit) to exhibit at the Gamescom Holland Pavilion. SMB organisations (MKB-bedrijven) with less than 25% of export sales or that have been registered for less than three (3) years at the Chamber of Commerce (Kamer van Koophandel) qualify for a Collective Activity Voucher. Organisations can apply for this voucher with a financial compensation of up to 50% of the participation fee with a maximum of € 1500,- excluding VAT (btw). More information on the Collective Activity Voucher can be found here (in Dutch).